Tomorrow it is Easter sunday which means, for most of us, the end of the period of lent. This year I decided to give up chocolate for lent (why did I put myself through that?!) and because of my lack of will power in the beginning I have to wait another week until my 40 days are officially over! And as I near closer and closer to this date I find myself craving all things chocolate more than ever, so much so that I've put together a list of chocolate treats that I want to bake. 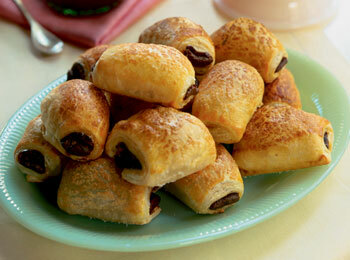 And the first things on my list are mini pain au chocolats (pictured above).